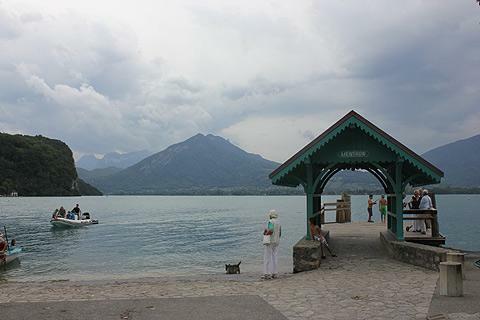 Menthon Saint Bernard is a village which sits on the edge of Lake Annecy. It is just a few kilometers from the fabulous town of Annecy and is on the sunny side of the lake known as the Rive Plein Soleil. Menthon Saint Bernard is a lovely village: the centre of the village is small and does not take long to explore, and is centred around the church and a tower. The church belltower is original but the remainder of the church was rebuilt in the middle of the 19th century. Its small port is delightful with its quaint wooden boat stop painted a blue/green colour and with views across the lake. A few boats are moored here, a mix of fishing and sailing boats and some boats you can hire. The lake buses set out from the villages of the Rive Plein Soleil including Menthon-Saint-Bernard from mid April to mid September: Lake Annecy is a really beautiful lake, surrounded by mountains and with a few charming villages dotted around its edge, each of which has one of the charming boat-stops. Taking the boat is a lovely way to explore the lake and its lake-side villages. Near the lake's edge there are quite a number of beautiful houses to admire as you promenade along the lake and around the village. 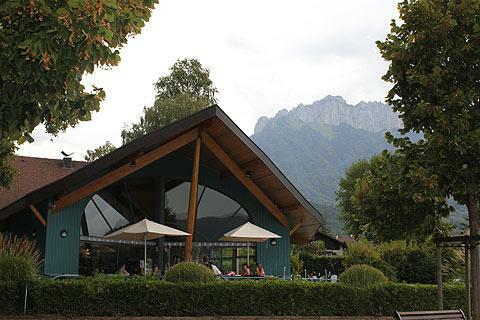 There is a restaurant close to the lake's edge if you wish to stop and admire the scenery. Menthon-Saint-Bernard has a beach which is watched over by a life guard (there is a small fee to pay to use the beach). There are small wooden piers in the lake where visitors can sit and sunbathe: these are very popular in summer! 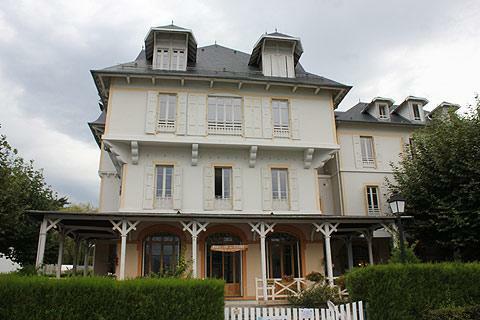 Up above the village and commanding a majestic view of the lake is the Chateau of Menthon-Saint-Bernard. 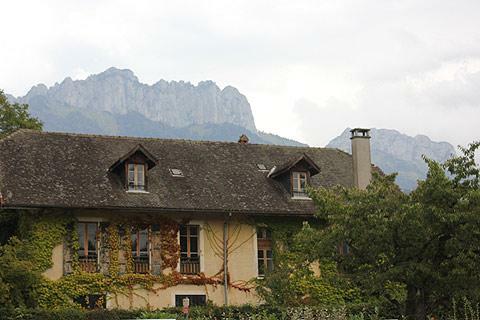 The current castle was built in the 13th century though there was an earlier castle and it was the birth place of Saint Bernard de Menthon who is the patron saint of mountain people. The castle was further modified many times over the centuries and renovated in the 19th century in a rather 'neo-gothic' style but is still a charming ensemble. The castle has been owned by the same family for about a thousand years and whilst it is private it can be visited. It has a number of turrets and an overall romantic appearance, so much so that Walt Disney saw the castle when holidaying nearby and used the castle as inspiration for Sleeping Beauty's castle! Inside the castle there are still many original furnishings and a particularly impressive library. The nature reserve of the Roc de Chère is nearby and this large rock offers great views over the lake. 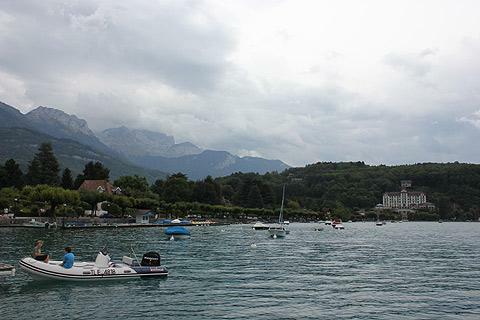 There are several other small villages around the lake - see the Lake Annecy guide. 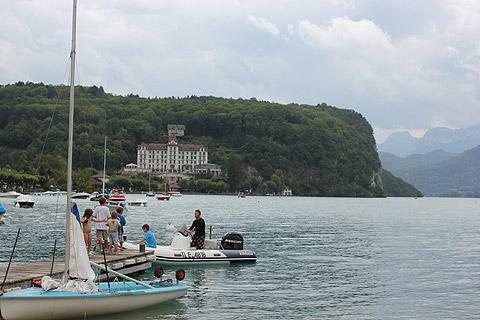 You will certainly also want to explore the impressive town of Annecy during your visit.